What happens when a teacher is a Steelers fan and the Student is a Broncos fan? Well, normally you would think the two would share a little harmless badgering the Friday before the two teams face-off in the AFC Championship game. That wasn’t the case in a Pennsylvania town on Friday. 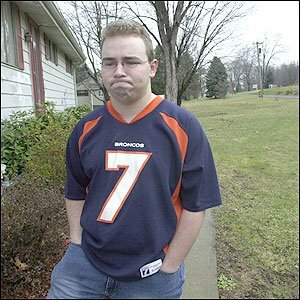 17 year old Joshua Vannoy from Big Beaver, PA. was forced to sit on the floor during a midterm exam in his ethnicity class -- for wearing a Denver Broncos jersey. His teacher, who was wearing a Steelers jersey, John Kelly called Vannoy a "stinking Denver fan," and had his classmates throw crumbled up pieces of paper him as he sat on the floor. Vannoy said he was so unnerved he left at least 20 questions blank on the 60-question test, and just wants out of Kelly's class because he's afraid the teacher won't treat him fairly now that the story reached the media. Did Kelly feel guilty or show remorse for the way he treated the high school kid? You tell me. You won’t find a bigger sports fan than me. I love my teams and support them through thick and thin but this goes well beyond the realm of sanity. I guess you could say that you won’t find a more stupid sports fan than John Kelly. Picking on a 17 year old kid because he is a fan of the other team tops mooning a team bus, dumping beer on players coming out of the tunnel and even streaking across the field. Heaven forbid that a kid comes to trick or treat at your house dressed up as a Cleveland Brown.